At the same time Julia Margaret Cameron was arranging her household into portraits and Munby was dressing up Cullwick, there was a movement in the United States towards viewing the unspoiled American West as idyllic and artists using it to construct a sense of nationalism. Many artists did much the same that Munby and Cameron did in carefully constructing their images to project an intended message or meaning. In the mid-19th Century, tension between expansion and industry, the city and the country, nationalism and land in the United States caused a boom in landscape portraiture that depicted the West as a lush, beautiful wilderness. A particular photographer by the name of Carleton E. Watkins took a different vantage point on capturing images of the American West. He was a commercial photographer responisble for publicizing the Yosemite region to the rest of the country. What Watkins did differently is that he showed the place as it was. Unlike the Munbys and Camerons, he selected his best images but did not fabricate them. Painters and photographers with the same focus as Watkins (to capture the West in art) strove to make their works the most beautiful, glorious, and inspiring. Watkins showed a real place as what it really was. 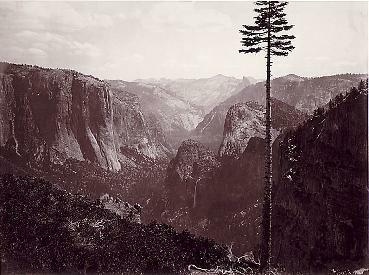 His photograph “Yosemite Valley from ‘Best General View'” shows his vision of showing what is really there. Where many artists would remove the ugly bare tree from the breathtaking view, Watkins embraces it as the focus for the picture. He does not falsify his image and shows that while the land is undeniably beautiful, sometimes it is ugly too, and that’s just the way it is. While I think the connection you’re making from Cameron to landscape portraits of the American West is interesting, I think saying that Watkins “does not falsify his image and shows that while the land is undeniably beautiful, sometimes it is ugly too, and that’s just the way it is.” is problematic on a number of levels. Didn’t ALL the landscape photographers of the American West showed the land “as is” — as it is near impossible to alter a landscape the way JMC could alter her subjects? It’s a matter of composition and agenda, the way I see it; by choosing to focus on a tree which does NOT convey the image of the “land of plenty,” Watkins is being just as subversive as the other mainstream photographers who focused on the expansive sweep of untouched land (Muybridge, etc. comes to mind). But then there is the whole issue of public and private collections. While the majority of images sent back to the East for use as public proponents of Manifest Destiny DID focus on the “land of plenty,” there were just as many images taken by the same photographers which *didn’t* perpetuate the “land of plenty” message, and simply were not popularized, or publically consumed. So I would either call all or none of the images “falsified,” if you’re referring for their focus alone. So I guess I will end by saying what all could have been said in one sentence (eeek, sorry for the rant, I didn’t meant to get carried away!) — that Watkins certainly *does* “falsify his image” with the definition you use of it– just not with hair and fingerprints as JMC (or drawing clouds on negatives as Muybridge does), but just by so consciously choosing his composition the way he captures.